After eight years of R&D, our Sietelunas® technology was developed, with highly durable gel injected nodes to prevent abrasion, and a honeycomb-like structure that delivers greater cushioning, stability and comfort. Seven strategically placed magnets and 100 micro beads stimulate the most important of the 7,000 nerve endings in our feet. 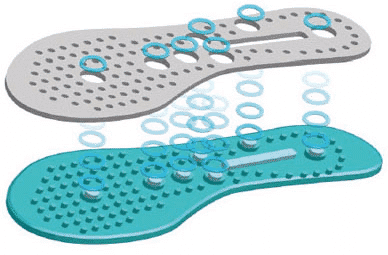 A recent study by the University of Alicante in Spain certified our Sietelunas® technology as helping to improve the distribution of pressure on the sole, and increasing stability and absorption. Our feet are a reflection of our health. The ancient art of Foot Reflexology, based on the improvement of the body through the stimulation of reflex points in the feet, inspired the conception of the Sietelunas® technology. Doctors and specialist advise their patients to walk barefoot on the sand, which has therapeutic benefits, and they endorse wearing Sietelunas® by Sanosan® for the same reason. A comfortable anatomically correct foot bed with breathable soles for an all day massage that wick away sweat, keeping feet fresh and odor-free. 7 strategically placed magnets and 100 gel infused micro beads utilize the art of Reflexology and Magnetic Therapy to promote optimal health from the ground up. Many of our customers refer to our footwear as the "Massaging Shoe". This is a testament of the technology and comfort features we apply in every pair we make. 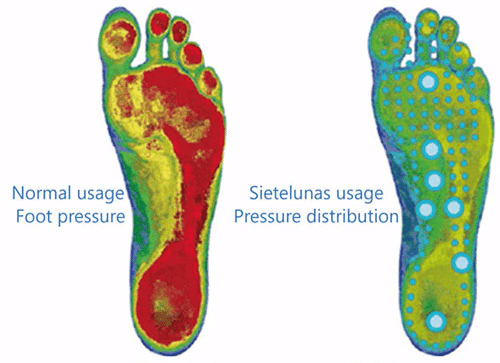 Our Sietelunas® technology has been subject of a study conducted by the University of Alicante (Spain) certifying it's effectiveness on improving the distribution of pressure on the sole, and the many benefits this has on our body. Patented HSQ® memory foam allows multi directional airflow in and out to provide you the ultimate in support. Memory foam with a "memory" that forms to your foot and never looses shape.